The following is an excerpt from Savvy Auntie: The Ultimate Guide for Cool Aunts, Great-Aunts, Godmothers and All Women Who Love Kids by Melanie Notkin (William Morrow/HarperCollins). In honor of Women's History Month, here are some inspirational quotes from some of our fearless Savvy "Auntcestors." Where would we—the entire planet, that is—be without these selfless, tireless women? Some of the most important, iconic aunties to the world were real-life ABRs; others were ABCs; all of them were driven to make the world a better place, one person at a time. 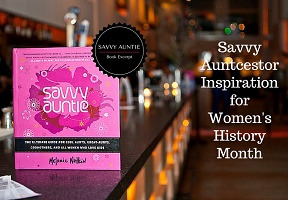 And based on some of their best bons mots, we’re pretty sure they would’ve liked being called Savvy Aunties, too.